I have Hadoop(pseudo distributed mode), Hive, sqoop and mysql installed in my local machine. Then I set the sqoop-env-template.sh file with all the information. Beneath is the snapshot of the sqoop-env-template.sh file. Even after providing the hadoop hive path I face the same error. sqoop-env-template.sh is a template, meaning it doesn't by itself get sourced by the configurator. If you want it to have a custom conf and load it, make a copy as $SQOOP_HOME/conf/sqoop-env.sh. Not the answer you're looking for? 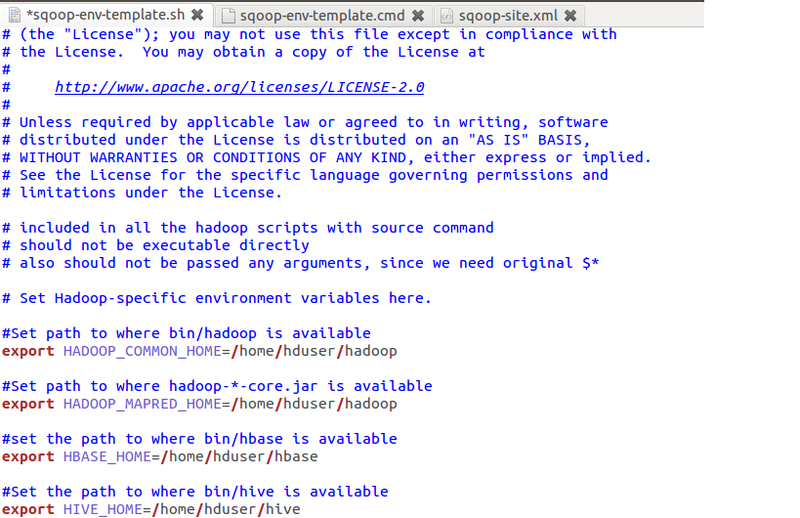 Browse other questions tagged hadoop hive sqoop or ask your own question.